While I love Barcelona, if you have several days there, you may find yourself itching to explore further afield. Figueres is my top recommendation. Less than two hours away on the train (barring construction delays), it is home to one of the country’s most popular museums, as well as a charming town that exposes some traditional Catalonian atmosphere that I think might be drowned out by Barcelona’s hustle-bustle. Here are the highlights, as well as some tips on getting there and back without hassle. Teatre-Museu Dalí (map) is the second most popular museum in Spain, and for good reason – Salavador Dali himself meticulously plotted and planned the entire museum, from the absurd decor on the roof and exterior to the playful interiors. Dali is from Figueres, so one can assume he wanted to really put on a lavish display for his hometown. This is also his burial place (believe it or not), so you can pay your respects and visit his crypt while you are here. 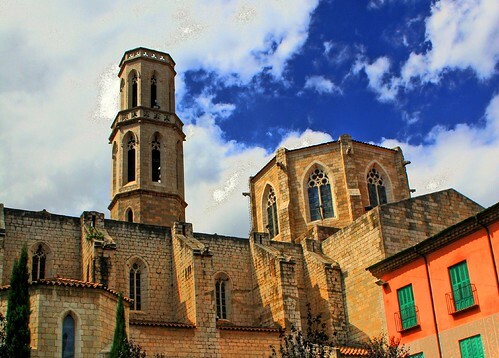 Find cheap short-term rentals in Figueres with iStopOver.com ! The displays include a massive amount of Dali’s works – the largest collection in the world – though many of his most famous pieces are found in the Prado in Madrid. Not all of the work is Dali’s; his personal collection is on display which features other pieces, so in case you totally hate Dali perhaps you’ll find the works he bought for himself or was given a bit more palatable. What makes the collection so interesting to me is the diversity of materials. Paintings, drawings, sculptures, engravings, installations, jewellery, holograms, photography, interactive exhibits all weave together to leave you a bit blinded by all of what is going on. I think that was as Dali intended it. Also, it’s one of those museums where just finding your way around is somewhat part of the experience. Supposedly Dali didn’t want any guides, that you just felt your way around – I think that would be kind of cool, just drop your coins in the slot and be on your way – though now you can get an audio guide, which I wasn’t a huge fan of. Buy your tickets at the “SERVICAIXA” bank station. It’s still the same price – 11EUR – but often a faster service here. Spare plenty of time for your visit. If you are a huge Dali fan, you could very easily spend all day here. Bring some change – there are interactive exhibits! Prepare for the worst. The museum can be warm, so check your coat in the cloak room, and it is crowded every month of the year, so it will be crowded. Very crowded. Museu del Joguet (map): this inexpensive museum (5 EUR) contains an excellent set of galleries with toys from all different periods of history. What kind of toys did Dali play with? Find out here. Despite the overwhelming popularity of Dali’s museum, this one is also very very good. Castell de Sant Ferran (map): this defensive position is where it all started in Figueres. They say this is the largest castle in Europe, and the walk around the exterior is nearly 2 miles. It’s a pleasant walk and well worth it in nice weather. Inside there is a bit of artefacts and a small cafe. Shop Til You Drop: Figueres has lots of old fashioned shops and stores, as well as your typical brands that you could find back in Barcelona. La formigueta, a chocolate shop, is always a popular stop. Just take a minute to look up – look around – at the wonderful architecture and atmosphere here. This town is full of history, not just Dali. Train really is the best option to get from Barcelona to Figueres. As of publication, the high speed rail to Figueres is under construction, which means in the future it will be a speedy 45 minute trip, but right now construction delays mean your travel might run between 1:45 and 2:15 minutes, so plan accordingly. To plan uour trip, I suggest you use the Rail Europe website to review the timetables – the Spanish website tends to drift back into Spanish suddenly, and it’s woefully difficult to understand. If you are quite certain on travel dates/times, you can go ahead and book them ahead of time. Just give yourself some wiggle room due to those construction delays! There is also an airport out this way – Girona/Costa Brava, so if you were flying you could come to Figueres and then head into Barcelona, or vice versa. It is a Ryanair hub and mainly services the beach resorts of nearby Costa Brava. If you’re considering spending some time in this area, Costa Brava has plenty of options, though otherwise I’d suggest heading back to Barcelona.